Mark your calendar to have a great time for an even greater cause! World Golf Village is preparing for the 18th Annual Riding into History event coming May 19 and 20 to the heart of WGV. Billed as a world class Vintage Motorcycle Concours d’Elegance, Riding into History showcases hundreds of antique and vintage motorcycles, as well as representation by exhibitors and motorcycle clubs. Best of all, the volunteer-run Riding into History organization is a big contributor to K9s for Warriors. In fact, they donated $40,000 to K9s for Warriors after last year’s event! 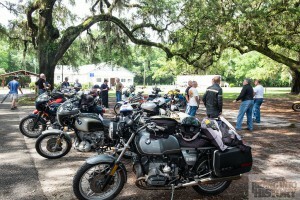 • Grand Marshals Historic Vintage Lunch Ride – Event entrants are invited to participate in this historic ride through Florida’s back roads, and of course, lunch along with the 2017 Grand Marshal! Space is limited and pre-registration is required. • Grand Marshals Dinner – At 6 p.m. in World Golf Hall of Fame’s Shell Hall, enjoy a delightful meal as the Grand Marshal speaks about his many motorcycle racing adventures! Register early as spots do fill up! • Riding into History Concours d’Elegance – Check out the event’s more than 300 vintage motorcycles (and outstanding awards for the best bikes). Spectator admission is just $10 and proceeds benefit K9s for Warriors. Gates open at 10 a.m.
• K9s for Warriors Charity Ride – Departing promptly at 10 a.m. from Adamec Harley-Davidson (8909 Baymeadows Road, Jacksonville, FL 32256), the volunteer-guided charity ride travels down to World Golf Village with plenty of relaxing fun for all riders! You can register online and on-site registration opens at 8:30 a.m.
• Gasoline Alley! – At 3 p.m., motorcycle entrants and volunteers are welcome to join together for a beverage at the Fairways Cafe’ Patio. Learn more about Riding into History by visiting https://ridingintohistory.org/.